This was a really scrumptious, quick after work jobby that took about 30 minutes I’d say. It went down well with the fiancée and most importantly, me. I didn’t follow a recipe, just threw together with what was in the fridge. 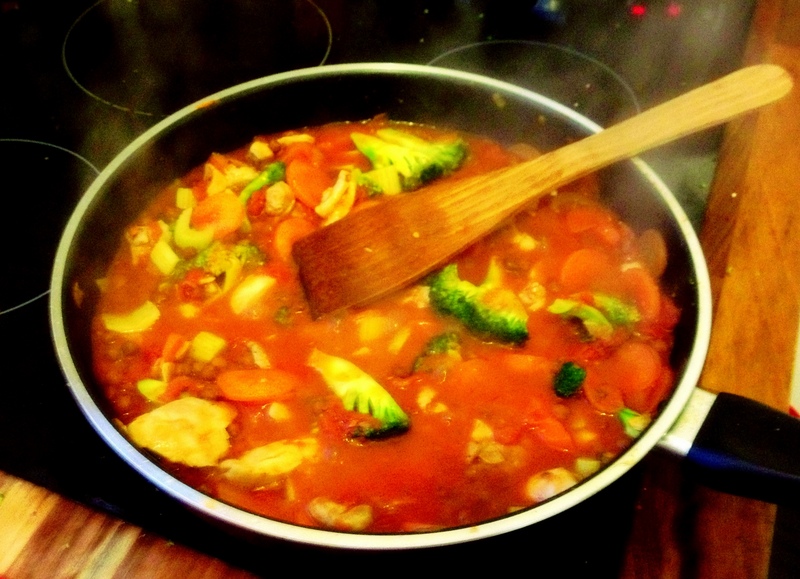 I find recipes great if you have something to cook for, but often not very economical. You have to be inventive with what you know is in cupboards don’t you. So my journeys home from work tend to be spent on the DLR with 50% of my head in a book or Evening Standard and 50% of my head visualising what’s in the fridge and what I can do with it. I remember back in my early twenties, when I first moved out of Mum’s, I could barely boil an egg. Perhaps that’s an exaggeration, I knew what went in things, simple dishes. What I didn’t know, was how to make them taste good, make the flavours blend rather than just sit on top of one another. I’m getting there I think. My fail safes for deep and rich flavours are garlic and anchovy, yum. Slice your garlic cloves, no too thinly, as though you were making garlic chips. I like a lot of garlic so it’s a good thing that my local green grocer on Stoke Newington Church Street sells veg that’s bigger, tastier and cheaper than the supermarkets. 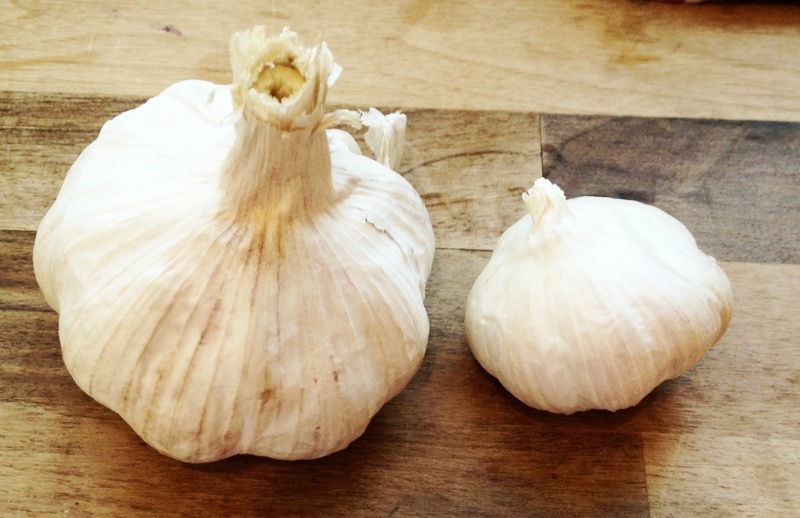 Look at this comparison between Morrison’s garlic and Stoke Newington Green’s garlic. Put your garlic in a low heat pan with olive oil, let it toast away. Then just as the colour starts to turn a little yellow as they cook through, crank up the heat to a high medium and add your chicken. As your chicken browns, in go the anchovies along with the oil they’re tinned in, then your veg. Let this all cook for a couple of minutes. Next, add you tin of plum tomatoes and smash them up a little with your spoon. You could use chopped tomatoes but I prefer to chop them in the pan. Add the chick peas. Use the tin from your tomatoes or peas to mix a chicken stock cube with boiling water, add to the pan and turn the heat up to a rolling boil. A couple of minutes at this high heat then down to a simmer. Season to taste, I would add pepper and ground coriander no salt as your anchovies and stock are salty enough. Check piece of chicken to see when there is no pink, you’re done. You could let this simmer a little longer for more flavour because chicken thighs are hard to over cook. Not impossible though so do be careful. 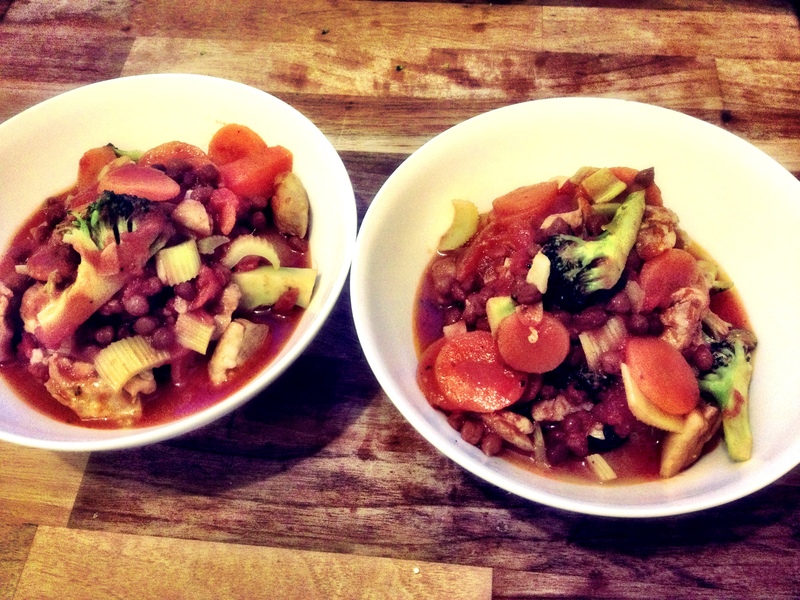 This entry was posted in Recipes and tagged 30 minute meals, anchovy, carrots, celery, chick peas, chicken, chicken thighs, Chickpea, Cook, coriander, Family, fiancee, fillets, food, Garlic, Home, london, mum, Plum tomato, recipe, Stock, stock cube, stoke newington, Stoke Newington Church Street, stoke newington green, tomatoes, vegetable on April 6, 2013 by sheeatsyummyfood.